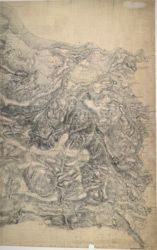 A section of the English south coast from Dunster to Watchet is covered by this drawing. Sand is indicated by a speckled grey wash, with grey shapes signifying rocks. Although it was not compulsory to include archaeological sites at the time of this map's survey, the draughtsman has noted an iron age settlement near Wiviliscombe as an 'Ancient Camp'. Several quarries are also marked,including a slate quarry at Oakhampton Wood.